In this post, I am reviewing a phone which is stylish, affordable and is loaded with a lot of features, Micromax Canvas 2 Plus. You'll further see a step by step review of this phone but first things first, this phone is featured here because of its cost, which is about 10,000 INR (as in September, 2013) and which is reasonably less as compared to the features it has got. The first look definitely goes with the size and looks of the phone. It has a huge 5 inch display which supports up to 720p HD content. The screen is a LCD capacitive display with 16M colours. The corners of the phone are rounded and it has three capacitive buttons for home, back and menu. The primary camera is an 8MP one with dual LED flashlight, the primary camera is 2MP. This phone runs on Android 4.2.1 Jellybean operating system. As stated before this phone has 8MP primary and 2MP secondary cameras. When we checked the quality, this pictures were great in both daylight and dim light conditions. However the quality does reduce in dim light conditions. Also, we found that some quality reduction also happens when photos are taken in good light with the flash on. If compared to the 8MP cameras of other bog brands such as Sony or Nokia, this one still has a big chance to improve, but nevermind it is the best in its class. Moving on to more important things, the performance of this smartphone beats all the big names in its price range. It has a quad core 1.2 GHz process, 1GB RAM and 4GB internal memory. All these specifications are great on paper as well as on practical use. 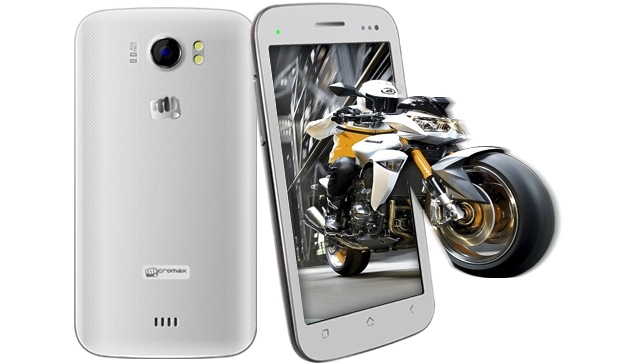 We have tested this phone with many high end graphics and discrete applications and it has proved that Micromax is no less than the international brands when it comes to performance. If you are looking for a phone which should be cool in performance, you can trust on this one. The phone uses a MideaTek MT6589 chip has the back end. The processor is a 1200 MHz Quad Core ARM Cortex-A7. The body is purely plastic with chromium plated edges. The weight is about 164g and the dimensions of the display are 147 x 76.5 x 9.7 mm. There are some issues with the GPS. The phone's location was not found with only the GPS put on. It worked good with AGPS though. The Android ROM installed on the phone from the factory has not been customized much and is almost the stock Android ROM. Everything else was found great on Micromax Canvas 2 Plus. If you are planning to buy a budget phone with features, you can trust Canvas 2 Plus and it won't disappoint you. We also recommend you to try the similar variants from Micromax: Canvas 2, Canvas HD and Canvas 4. We are planning to cite reviews to these too very soon. This is all in this post. Thanks for reading. I purchased this phone just before half year. It's processor speed got reduced. Recently water has fallen on the phone and from then it stopped working. It is not even switching on even after drying the phone. It won't worth much.